Test yourself! How much do you know about the history of collegiate athletics? 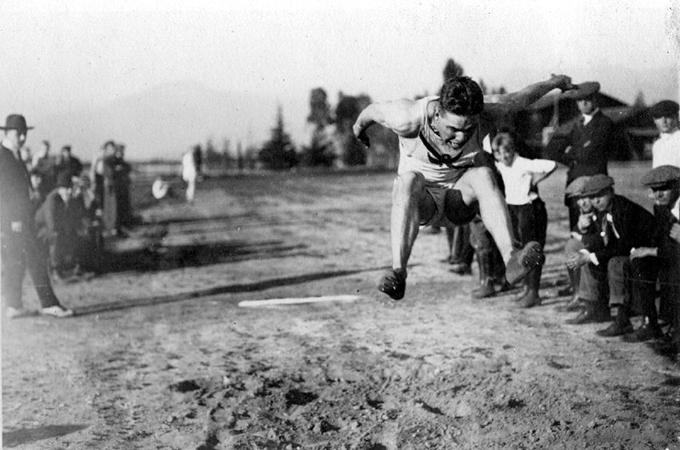 U of R student-athlete William J. Yount ’21 shows the talent that brings him to the 1920 Antwerp Olympics. University of Redlands History Professor Matthew Raffety helped out the Bulldog Blog by sharing some fun facts about the history of collegiate sports. How much do you know about the topic? Find out with this #URBrainteaser! 1. When did collegiate sports begin? 2. In the early days of football, when there weren’t enough University of Redlands students to play on a team, who filled in so a game could take place? 3. Why was the first intercollegiate football conference established in 1906? 4. What was a key reason the Southern California Intercollegiate Athletic Conference (SCIAC) was launched in 1915? 5. Which colleges were founding members of the SCIAC? 6. From the early to mid-20th century, which sports were seen as most socially acceptable for women? 7. What event(s) helped launch women’s sports programs in universities across the country? 8. Which decade saw the biggest growth of sports facilities on university campuses? C) Raffety notes collegiate sports began in the early 1850s. At first, classes instead of schools played against each. The first recorded football game between schools was Rutgers versus Princeton in 1876. Back then, college football had very different rules, and each school played different versions of the sport. A) In addition to organizing the sports program, it was fairly common for faculty to compete as “students” during football games. A) An intercollegiate conference was established in 1906 to make football safer, says Raffety; it would become the forerunner of the National Collegiate Athletic Association (NCAA) and formed the foundation of the modern sport. Before this time, football, which was played without protective equipment, was dangerous and bloody. In 1904, there were 18 football deaths and 159 serious injuries from the collegiate sport. A) The U of R was one of the five founding members of SCIAC, with California Institute of Technology, Occidental College, Pomona College, and Whittier College. Redlands and Occidental are the only schools with uninterrupted membership. B) “Although women’s team sports remained controversial in the mid-20th century, elite sports—especially tennis and golf—had long been exempted from concerns that sports were inappropriate for ‘respectable’ women,” Raffety says. Many female athletes in these sports were able to make a name for themselves before university programs existed. C) “In the 1990s, fierce competition for students put pressure on colleges throughout the country to build bigger and better facilities,” Raffety says. “It’s hard to display to prospective students the quality of what happens in classroom—but you can show people buildings and sports complexes.” It was around this time that new athletic facilities for softball, aquatics, soccer, and more were built at U of R and full-time coaches were hired for softball, soccer, and lacrosse. For more on the history of collegiate sports at the U of R, see “Game time” in the latest issue of Och Tamale magazine; for more on U of R athletics, see the Bulldog Athletics web pages.